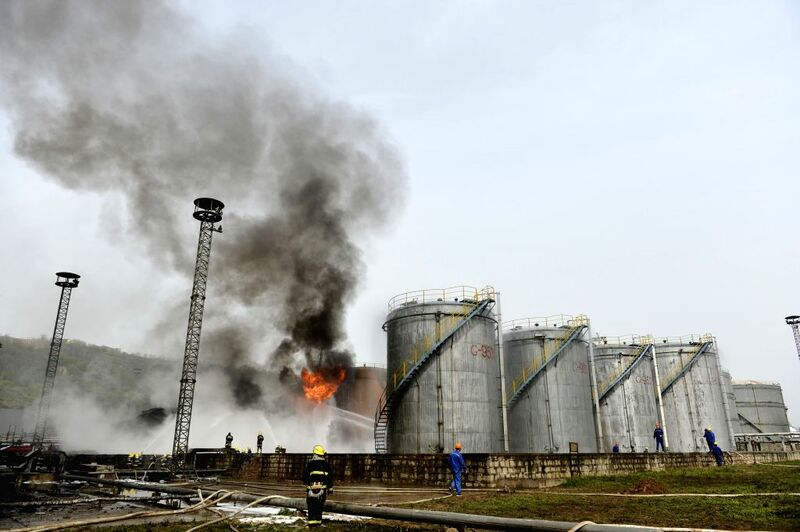 YAN'AN, April 26, 2014 (Xinhua) -- Firefighters try to extinguish fire at the site of flash explosion on three light crude tanks at the refinery plant of Shaanxi Yancheng Petroleum Group in Yan'an City, northwest China's Shaanxi Province, April 26, 2014. The incident occurred at 1:48 a.m. on April 26, burning three people at the refinery. Rescuers rushed to fight the fire and send the injured people to a local hospital. As of 6 a.m., rescuers have put the fire under control and set up five intercept dams at upper reaches of the nearby Luohe River to prevent the pollution risks. Local government authorities have relocated 300 residents in the nearby village.